I’m obsessed with potatoes. I could eat them with every meal every day for the rest of my life and never get bored. There’s something very comforting and satisfying about how they taste no matter how they’ve been prepared. Obviously eating a solid potato diet is not recommended (damn you nutrition experts!) 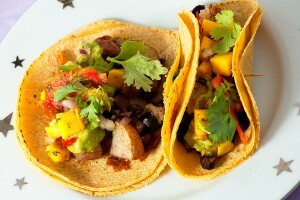 but every once in a while it’s nice to treat yourself and these Vegan Potato Bacon tacos will not disappoint! I’ve had a few versions of potato tacos in my life and they normally tend to consist of some combination of potatoes, bell peppers, onions & hot sauce. I wanted to try something a little different with these. 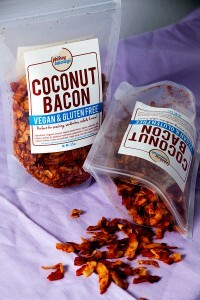 My husband suggested bacon, which I thought was brilliant, and immediately thought the coconut bacon from Phoney Baloney’s would be amazing! If you haven’t tried this stuff yet, crawl out from under that rock and do it now! I had to stop myself from eating the entire bag during cooking because it is so addictingly delicious! Crispy, smokey and very reminiscent of what I remember bacon tasting like, only without the unnecessary cruelty! Guilt free goodness. Check out their website to find out where you can find it near you! When I was coming up with this recipe I was a bit concerned the ingredients would be weird together, but the flavors blended nicely and the tacos turned out super tasty! 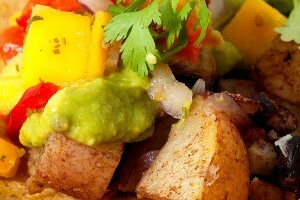 The mango salsa was the perfect compliment to the coconut bacon. This will make about 8 tacos. 1. Preheat oven to 450°. Fill a large stock pot with water and put on the stove to boil. 2. Once the water is boiling, parboil the potatoes for 5-6 minutes, checkin often. You don’t want them to get mushy, just barely tender. Drain water and transfer potatoes to a large mixing bowl. 3. Add beans, red onion, olive oil and cumin to the bowl and mix well (be careful not to smoosh the potatoes). Season with salt & pepper to your liking. 4. Spread potato mixture evenly onto a cookie sheet and bake for about 18-20 minutes. 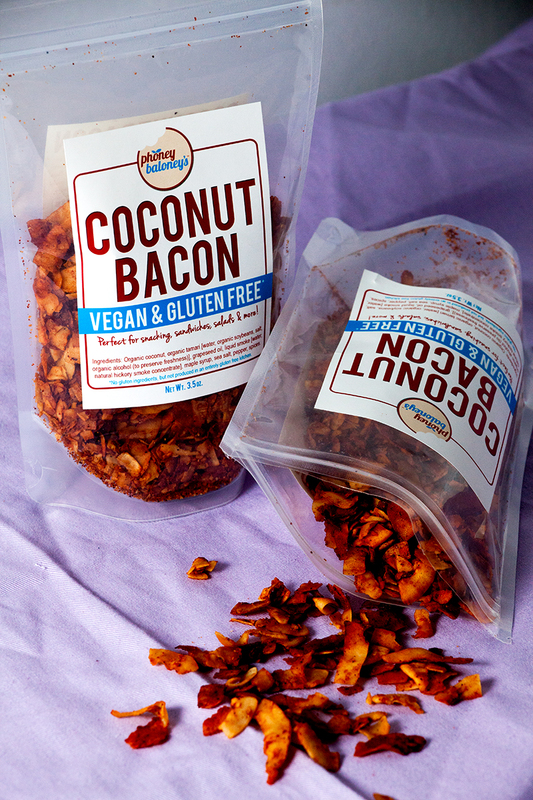 During the last minute of baking, sprinkle coconut bacon over the mixture – just long enough to heat it up, you don’t want to burn it). 5. 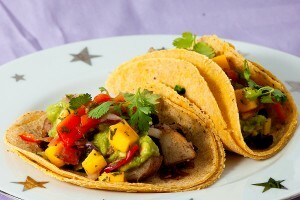 Warm tortillas – I like to wrap them in wax paper & foil and stick them in the oven for 5-6 minutes. 6. Spoon potato/bacon filling into a tortilla, top with a healthy dose of guac and mango salsa. Garnish with cilantro. *I bought my guac & salsa pre-made from Whole Foods. If you have the time, homemade is always better but alas I am a busy girl and I need some help sometimes!